PADI ADAPTIVE SUPPORT DIVER Learn techniques to buddy any diver with physical or mental challenges. Have you ever dived with a buddy with limited mobility or any form of disability and wondered how best to work with them to support and encourage? This course aims to give divers insight into what is required to adequately support a disabled diver. The fun part of this course is working together to develop adaptive techniques to assist any diver with mental or physical challenges, and allowing the diver to achieve ambition and enjoyment underwater. PADI Open Water Diver or PADI Freediver or higher. Emergency First Response Primary & Secondary Care course completed within 24 months. How to work with a disabled buddy to assist effectively & safely. How to become more aware and mindful of individual considerations & challenges when diving with a physically or mentally challenged buddy. How to apply adaptive thinking and techniques to find novel solutions and methods to achieve a goal. How to focus on what a diver can do and not the disability. Knowledge development session and accessibility workshop. As the PADI Adaptive Support Diver is a standardized course it may be used towards PADI Advanced Open Water and Master Scuba Diver ratings. 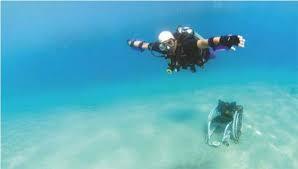 Contact us to take the Adaptive Support Diver Cpourse. Take the Master Scuba Diver Challenge.